Proudly presented this dream apartment in the first row at the Dümmer. Best lake view on the Dümmersee from the balcony. DümmerDiva The comfortable 95 sqm apartment at the Dümmersee leaves nothing to be desired. 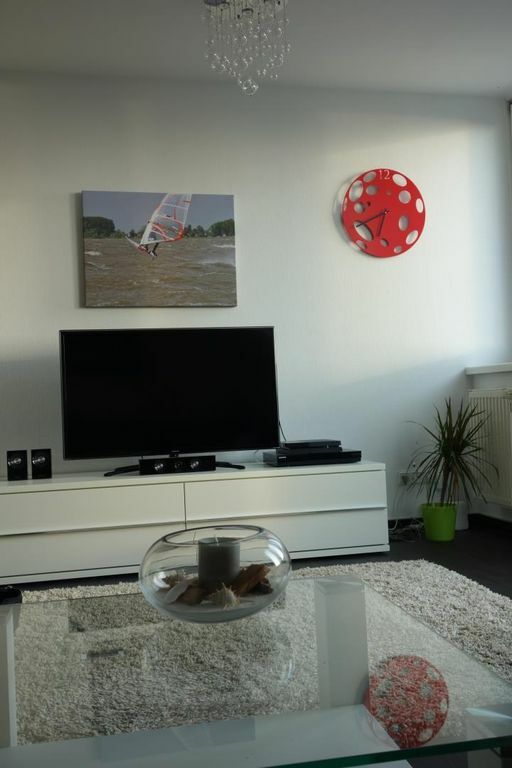 Situated on the second and third floors, the apartment offers a fantastic view of the lake of Damm. Relax during the day in the comfortable seating area in the living room or in the studio in the relaxation chairs. In the evening, enjoy the spectacular sunset over the Dümmer from the balcony. The apartment was renovated in 2013, the kitchen renewed and the bathroom I completely renovated. The spacious and modern kitchen is fully and extremely equipped. Highlight is the roof studio with the most beautiful view of the Dümmersee. This apartment can accommodate 4-5 people and is a Non smoking apartment. It is not suitable for pets. The apartment "DümmerTraum" is located in the residential area Dümmerpark in Lembruch. It is 50 meters from the dyke. The sailing school Schlick and the sailing club Dümmer are in the immediate vicinity (incl. Boat and catamaran boats). Experience bike and hiking tours in the flat moorland around the Dümmer, in the Stemweder or Dammerbergen mountains. In the winter, the Dümmer also offers a beautiful backdrop for your holiday and various winter leisure activities, B. Ice skating and ice skating. First-class locations such as the "Seeblick" (50m), "Strandlust" (250m), the "Storchennest" (Hüde) or the "Bar Dü Mar" (Hüderstrand) invite you to enjoy the Dümmer See. Restaurant "Zur Rohrdommel" | Restaurant Tiemann (in Lemförde-Stemshorn) | Restaurant Wilhelmshöhe (in Haldem-Stemwede) Aalräucherei Hoffmann (directly at the Dümmersee). The Dümmermuseum (about 300m) The Wiehengebirge (about 20km) The Museumsdorf Cloppenburg (about 40 km) Museum and park Varusschlacht in Osnabrücker Land (about 20km) Orchid Growing Lemförde | Recreational pool Dümmer (Hüde) Tennis courts (Lembruch) Tennisplätze in Diepholz indoors and outdoors Museums in the district of Diepholz Naturfierenpark Ströhen | Roundtrips over the Dümmer Outdoor pool Diepholz and indoor pool Diepholz NEW! Marry at the Dümmer z. For example, on the sailing ship 'Berlin' of the Segelschule Schlick. The bathroom in the second floor has a large comfortable shower with floor-even entrance, a spacious vanity and toilet. Also here is the washing machine in the bathroom. The bathroom on the upper level also has a shower, toilet and washbasin. Enjoy water sports on the lake Dumber or leave for a walk or a bike ride and relax.